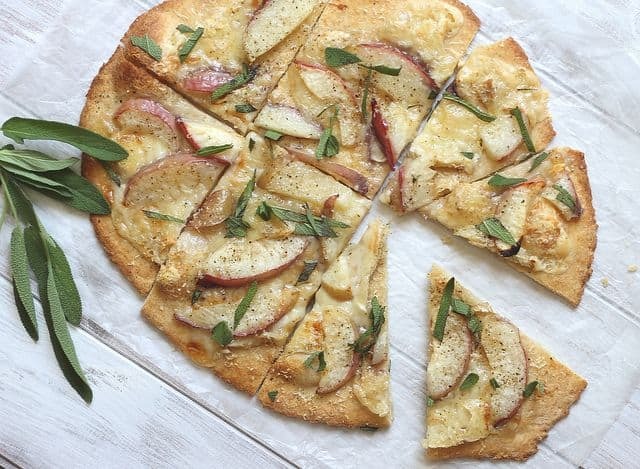 This summertime inspired pizza is topped with nectarines, brie and sage. It’s sweet, savory and a delicious way to switch up pizza night. On a weekly basis I bookmark, favorite, if I actually used pinterest…pin and sometimes even old school it up and print out far too many recipes. My google reader is like feeding an addiction. A food obsessed addiction that just keeps growing and growing every time I quite literally, feed it. It’s out of control. So I’ve decided to start formally sharing it with you all (they say admitting addiction is the first step right?). I don’t know how often, maybe once a week, maybe a couple times a month, maybe whenever something comes out pretty enough to photograph, but consider this From Bookmark to Blog a new series. There’s so many amazingly talented people out there making food, capturing it in a way that makes you salivate at your computer and then taking you through an experience with their writing that they deserve to be highlighted and their creations shared. So why not start with pizza? Because who doesn’t love a good pizza? 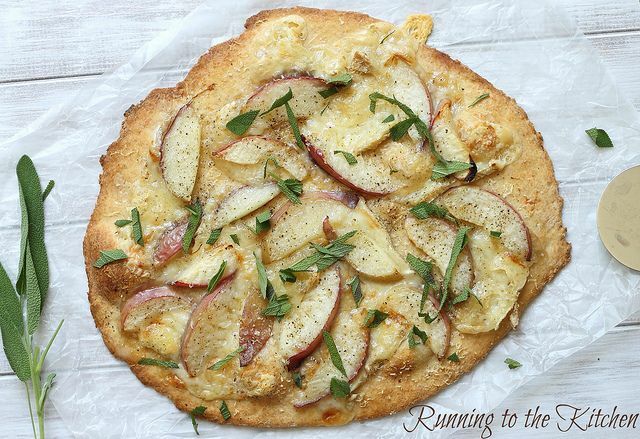 Pizza is always a good thing, but throw some perfectly ripe summertime fruit on there combined with fresh herbs and a thin crust? Omg. I die. Brandy and I split a CSA this summer. Some weeks I pick up and drop off at her house and other weeks vice versa. Two weeks ago she brought me a generous amount of sage from her potted garden and then 4 days later posted this recipe on her site. Destiny? I thought so. When it comes to stone fruits, I am firmly in the nectarine camp. Peaches are great and I do like them, but a high school experience with a half eaten peach and a worm scarred me a bit. Maybe it’s just me, but I also think peaches tend to be mealy a lot more often than nectarines. White fleshed nectarines are the best stone fruit out there in my opinion. I will gladly pay $1/lb more for their “uniqueness”. So combining my favorite fruit with pizza was pretty much grounds for an immediate bookmark. I didn’t have blue cheese (which I imagine would be delicious) but brie worked amazingly well with this too. Like Brandy says, the sweetness of the nectarines goes perfectly with the sharpness of the cheese and while brie isn’t sharp in the same way blue cheese is, it still has a very distinct cheesy sharpness to it that you don’t get with a traditional mozzarella pizza. Also, I made that crust. I’ve become a homemade pizza crust convert since our PW experiences and it makes me so damn proud every time now. Just thought you should know. Verdict? It’s gorgeous, it makes you feel like you’re at a gourmet bistro and the only thing that could make it better would be a nice cold glass of sauvignon blanc. Fruity/sage pizzas are one of my most favorite things. 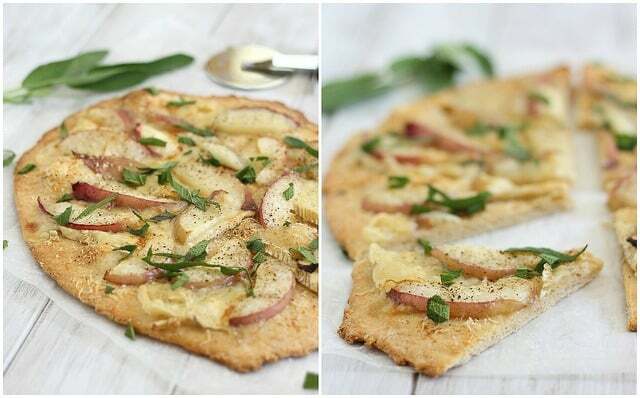 I’ve only tried apple/pear so I’m excited to incorporate nectarines next! What a great idea!!! I’m the exact same way. Pinning, favouriting and saving recipes all week through my reader, magazines, cookbooks etc. what a nest way to focus yourself a bit and do one recipe a week from Bookmark to Blog. Looking forward to reading the posts :) also, this pizza sounds sooooo good! I love Brie with fruit… A couple months ago I made crepes with bananas and Brie and it was glorious! I can only imagine how great of a combo Brie and nectarines are. Your crust is amazing cracker thin, I love it! Your crust is so perfectly golden brown too… Gorgeous! MMM…I’d love to try this pizza. It looks so tasty. “There’s so many amazingly talented people out there making food” – yes and after reading blogs, Foodgawker, and Pinterest…it just grows and amazes me every day. This looks incredible. I need to get on the fruit/pizza bandwagon. Sooo pretty. I too prefer nectarines, it’s the peach fuzz that puts me off. Can’t wait to try this! I think Cambozola would also be great on this pizza. Wow. Beautiful photography and a beautiful recipe! You’re feeding my nectarine obsession AND my “habit” (it’s much worse than a habit, to be honest) of printing out multiple recipes from blogs each day. There’s no way I can make as many recipes as I print…but I definitely try. And I have to say thanks for all of your recipes that I’ve printed and tried – honey roasted grapes + grains, cherry-almond buckwheat bake, several oats recipes, and my favorite, chia kefir pudding. Thanks! mmmm…..i love brie so hard! What a great idea of sharing things from around the web that you love. Although this might be a problem for my Google Reader addiction……..
such a great recipe! love it!